At the beach this morning. 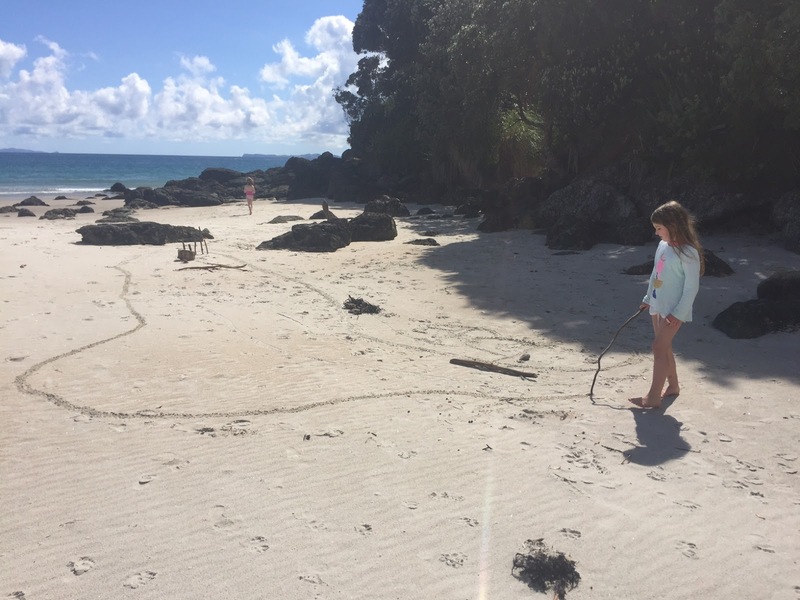 We are several weeks into homeschooling L and have taken the whole family away on a mid-term beach holiday. Since we don't have our printer with us, I'm hand-writing L's lesson plans and activities, but secretly I'm enjoying that. 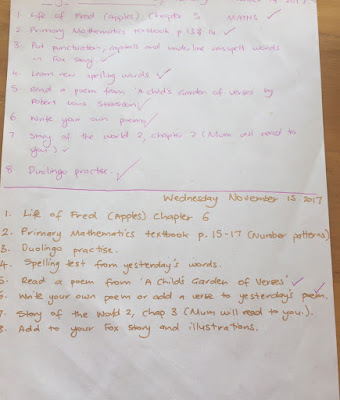 Here's L's task list from the past couple of days. It's a bit hard to read because I've been using different coloured gel pens to keep things exciting for her. Ha. 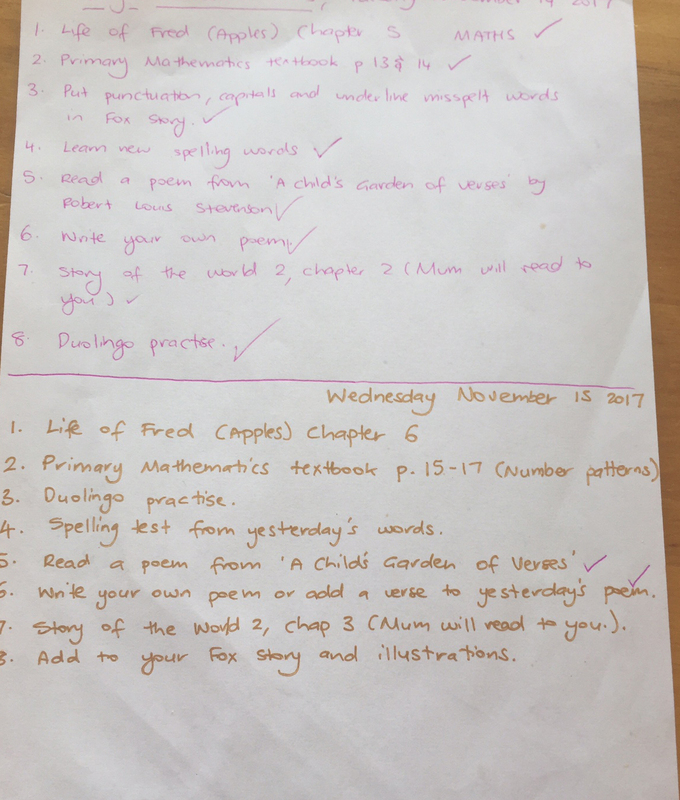 But basically the list has a bit of maths, spelling, poetry reading, poetry writing, French practice, history and story writing. It changes slightly each day. The general plan was for her to do set homeschooling tasks in the morning and then have the rest of the day for beach trips and activities, but yesterday we did that and a rainstorm arrived in the afternoon so we missed out on outside time. Today we woke up to sunshine, so I took the kids straight to the beach and then L did her homeschooling in bits and pieces over the rest of the day. I'm glad I did that, because it rained again this afternoon. 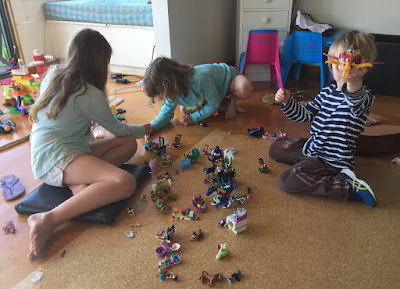 Before we left for this holiday, I caught up with a couple of homeschooling friends so they could show me the curriculums they use and recommend. One of the friends, Geraldine, lent me stacks of resources, which is so wonderful because it gives us a chance to try them out before deciding whether to spend the dosh on them or not. 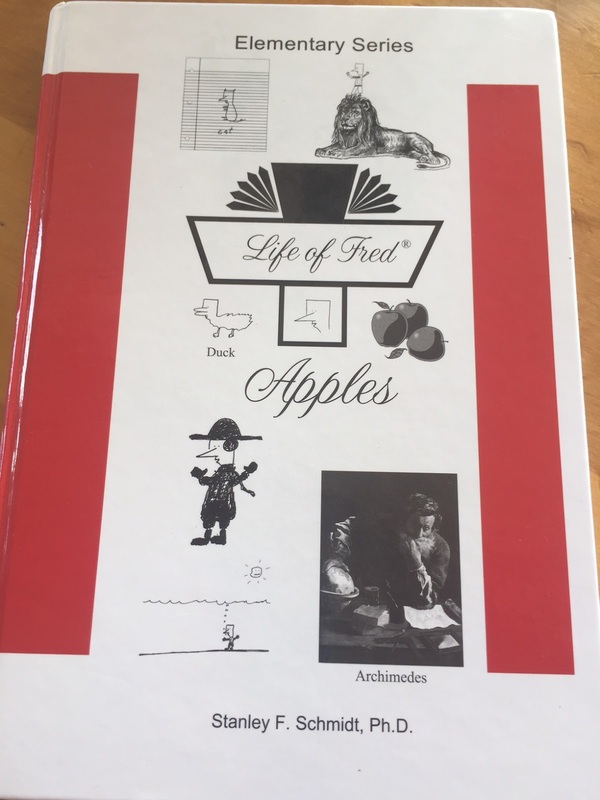 The whole family has fallen in love with the Life of Fred maths series she lent us, so this is one I'll definitely be investing in. It's maths told in quirky, hilarious story form. Along with L, S has also been working through the first Life of Fred book, Apples (since we pulled her out of school for this holiday) and she absolutely adores it. J inevitably comes and sits in on S's maths sessions too, because he finds them so fun. The other good thing about the Life of Fred is it shows you how maths is used in real life situations, which is how most of us use maths anyway. 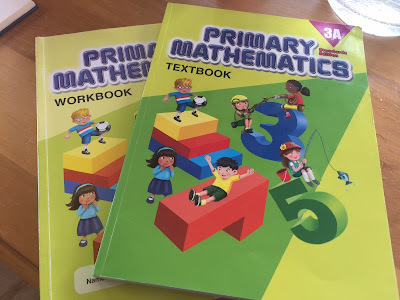 For a more traditional maths lesson, L has been trialling Primary Mathematics, which is the American version of Singapore Maths. (I think that's right). 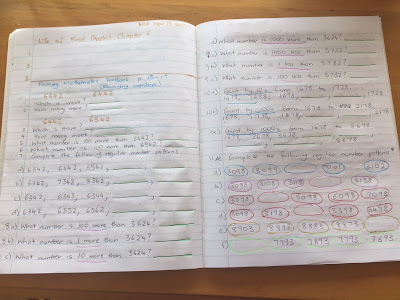 L is more reluctant to do this type of maths because it's straight maths without all the fun story, but I think it's good for her as it ensures she's learning everything she needs to in the order she needs to so she doesn't get stuck later on. I'm not a teacher, so it reassures me to know she's covering the whole curriculum. 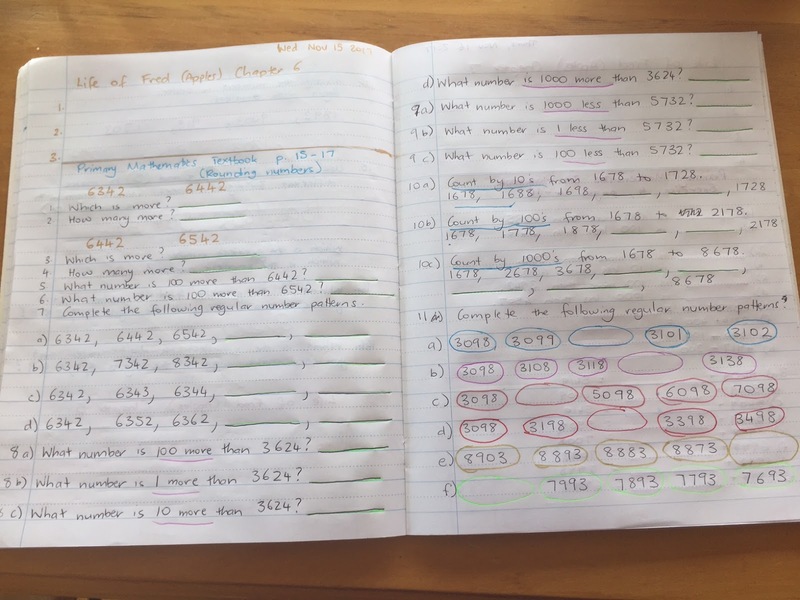 Since we're just borrowing the Primary Mathematics books from Geraldine to trial, I've been writing out L's daily maths activities in an exercise book with gel pens to make it look fun. S helped me draw all the ovals in the following photo, and ended up answering all the questions as she went too. Sneaky maths is the best kind. 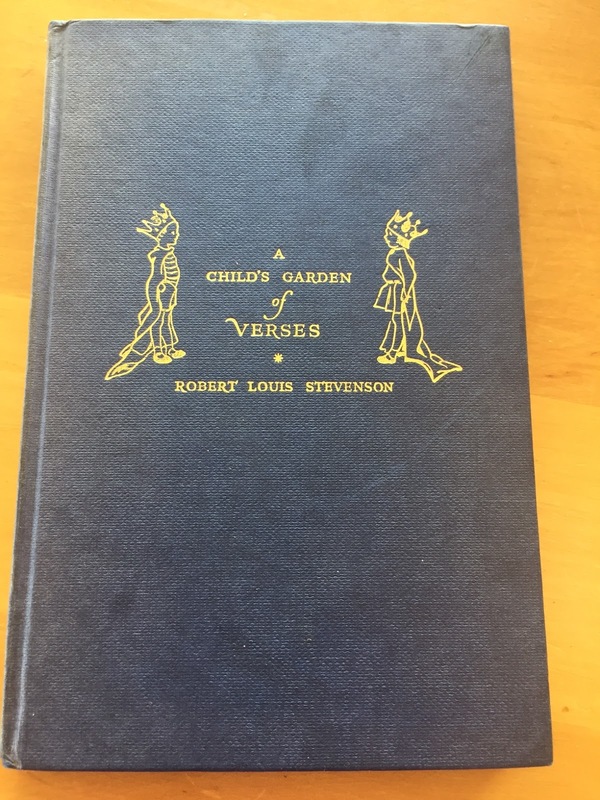 My friend, Erin, lent us this gorgeous poetry book, A Child's Garden of Verses, by Robert Louis Stevenson and L adores it. She reads a poem or two a day and then has a turn writing her own poem. I encourage her to write her poem out loud before she writes it down, so she can get the rhythm right. She fancies herself a bit of a songwriter, so poetry appeals to her. Today she didn't want to write an original poem like I'd told her to and asked if she could copy out one of Robert Louis Stevenson's poems instead. I said that was fine. I'm pretty flexible about how we do things, and like that I can be with homeschooling. 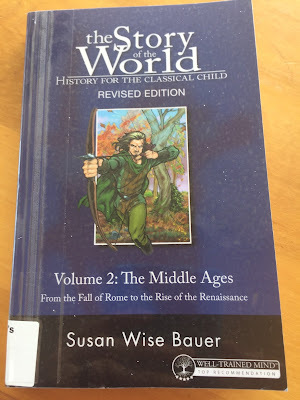 My friend, Erin, also told us about The Story of the World history books and showed us her copies when I met up with her last week. I fell in love, and ordered them from the library. Volume 2 arrived just before we left for our holiday. We don't have the activity book that goes with it, so I'm just reading a chapter to the kids each day and getting them to draw pictures or act out scenes from the book. The first couple of chapters were about Rome and J acted out being a gladiator, while S strummed the guitar and made up songs to go along with the story. L drew pictures of the things I was reading. I'm planning to buy the whole series and its activity books because there are some really cool activities in there. 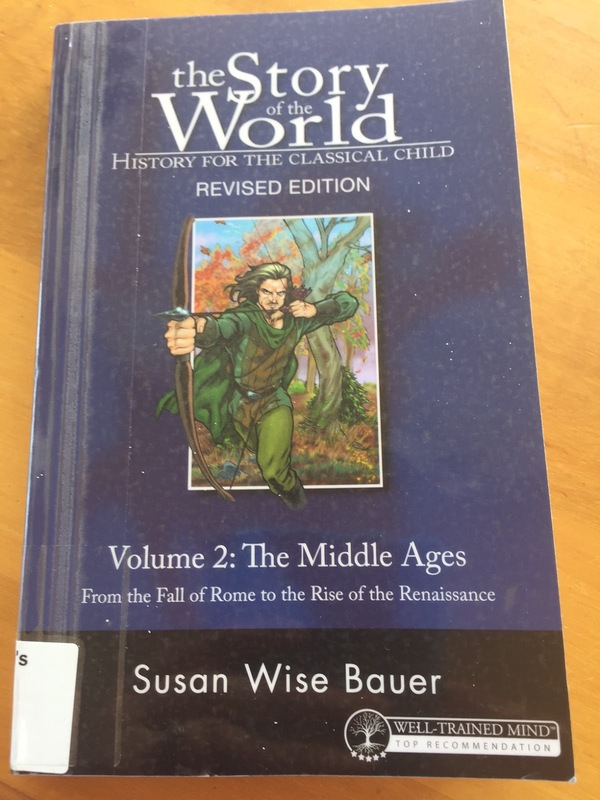 I'm learning so much from The Story of the World. We brought our laptops on holiday with us, so L is also doing free Duolingo French exercises each day. I learnt about Duolingo from The Prudent Homemaker. It's such a good program and I'm glad I found out about it because I used to pay for French lessons for L, but she barely learnt anything with them. She's learning far more through Duolingo, and it's free. We also brought Lego and Duplo with us on holiday, so the kids spend a lot of time in imaginary play constructing things with that. It brings Paul and I so much joy to watch them play and create together. L checked out a big pile of Geronimo Stilton books from the library to bring on holiday and has already chewed through most of them. She's been reading so many more books since she started homeschooling. It's like she's finally got the mental space to read. Some days she gets through three books. We brought the board game, Dominion and two of its extension sets on holiday with us, so the girls have been playing that most days with Paul and I. It's an excellent game for strategic thinking, mathematics, reading and I'm sure many other things as well. We love it. It's different every time too, because we change out the cards, which means we don't get sick of it like we do with more static board games. All in all, homeschooling is going really well. I'm convinced we made the right decision to pull L out of school. Now S is saying she doesn't want to go back to school next year, so we shall see. We shall see. If you're a teacher or homeschooler, what resources do you recommend?